Attic Ventilation brings clean, fresh air in and removes stale, hot air. Conquer North Texas' Roller-Coaster Weather with Attic Insulation. New Doors can Impart the Appearance of Greater Value to Your Home. Update and Repair Your Fence for Appearance and Security. Long-lasting, Full Warranty Secures the Roof Over Your Head. Between you and the elements, overhead – comfort, convenience, style and protection. EHS Services Inc. specializes in working with the homeowner from start to finish of the project. We help you understand all of your options so you get the quality residential roofing system and exterior services you deserve. We install Roofing Systems, so you’re assured that the correct, proper steps were taken in the installation of your new roof. EHS Services’ manufacturers, Atlas Roof, GAF, and CertainTeed only guarantee roofing systems, as the installation process ensures the integrity of the roof. Whether your budget requirements call for a premier quality upgrade or a value-conscious selection, our roofing system approach ensures a long-lasting, 30-year warrantied new roof for your home. When you choose EHS Services you have the assurance of an established, Plano, Texas-based company whose principals have been in the roofing business 20+ years within the Dallas/Fort Worth MetroPlex. These guys are amazing. Returned my calls, showed up on time, finished on schedule. Just a true pro. I just want to say THANK YOU EHS Services for getting the job done right! Very professional and fast – as promised! I highly recommend them to anybody who needs roofing services! Thanks Michael! 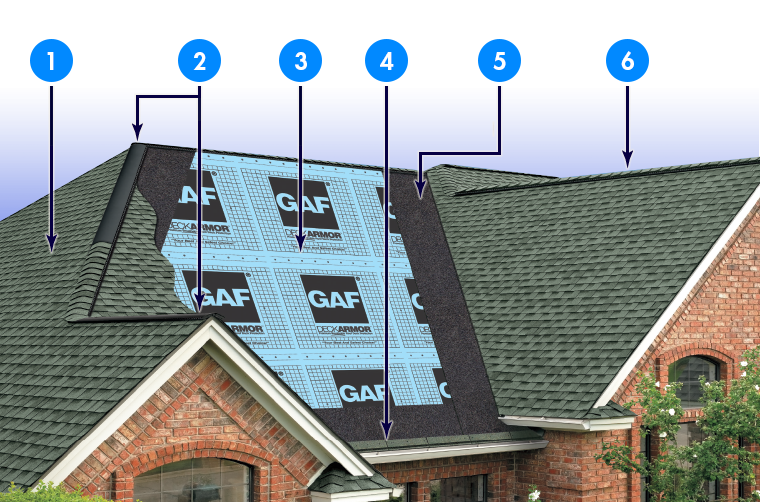 The highlighted items above are the basic components involved in replacing your existing roof with a new GAF, Atlas, or CertainTeed roofing system. Find out more about your roof’s installation. See the SIX KEY COMPONENTS OF A ROOFING SYSTEM. Replacing your roof is a major homeowner responsibility and expense. We recognize that when the roof is replaced, other exterior updating improvements may be required. To the homeowner’s advantage, attic insulation, attic ventilation, window, doors, exterior fencing and gutters can be be installed or updated at the same time the roof is replaced. EHS Roofing & Exterior Services makes it easier to do needed improvements. We’ll assist you in defining the needed updates and guide you in how best to schedule the improvements. As the owner, this can be a significant benefit for you. You’re getting the updates to maintain your residence’s market value, and getting the peace-of-mind that quality, warranted materials and guaranteed workmanship provide. As an added, but not least benefit, your home is now more attractive than prior to using EHS Services’ roofing replacement and exterior updating. When you are having your roof replaced, think of quality above all else – call us at 214.775.0848. A sampling of recent roofing projects by EHS Services. Underappreciated, but essential. The proper location and installation of your home’s gutters is essential to rain-water control for natural absorption within your property and run-off into the public systems. Gutters can avoid lawn pooling and potential flooding within your home. Properly installed gutters protect your home from repair. When installed with the roof, water is channeled correctly into the gutters, thus avoiding water trapping and saturation of the fascia and the resultant soffit and fascia deterioration. Let’s talk gutters, call us at 214.775.0848. Residential Windows enhance the exterior attractiveness of your home and help to create the quality feeling and comfort of the interior living space. Whether you prefer open and airy or low-light and cozy, windows, selected for the North Texas’s constantly fluctuating climate, properly installed, help insulate your living area from heat and cold, significantly increasing your HVAC system’s efficiency and saving on your yearly energy billing expenses. Improve your atmosphere with a call to us at 214.775.0848. Attic ventilation is like a ventilator for your home – it offers figurative life-support for your attic, thus bringing fresh air into and circulating hot, stale, contaminated air out of your attic. In doing so, it serves to help regulate the temperature in your attic, creating a buffer zone between the roof and your living space. In turn, ventilation helps to moderate and efficiently cool and heat the living space within your home. Fresh attic air brings clean, comfortable air in your home when you call us at 214.775.0848. Beat the North Texas Summer Heat — Stay cool and reduce energy bills. Don’t Suffer Winter “Chill-Out” — Stay comfortable during North Texas’ winter weather roller-coaster. Attic insulation is a commonly forgotten element in obtaining energy efficiency and living comfort in your home. It’s a huge home improvement that will have year-in-and-year-out benefit for the residents’ personal and financial well-being. Find out why “R-Value” is important for overall comfort and what’s the best “R-value” for your home, call us at 214.775.0848. Frequently, your residence’s doors are the same age as the roof you’re having replaced. In older homes, the doors are even much older. Worn and damaged doors should be replaced at the same time as your roof, and submitted under the same insurance claim. Your new doors will function better, improve the walk-up impression upon entering your home for yourself and visitors. If you’re planning on or are selling your home, the improved curb appeal of new doors will impart the appearance of greater home value. Call us for a quality entrance to your home – 214.775.0848. One of the best times to repair or replace your residence’s fence is at the same time that you are having other improvements made to your home that can be included on your insurance claim. Replace an unrepairable, aged fence with a new one using materials and coatings that will weather-well and retain an attractive appearance longer. Or, update a repairable fence with new slats, posts, and closures, and then stain to complement the overall new look of your updated home. There’s no reason to “walk the fence”, call us at 214.775.0848. EHS Services’ roofs are backed by our workmanship guarantee and 30-year manufacturers warranty for roofing-systems . The most professional team I have ever had the pleasure to work with! Knowledgeable, friendly and very efficient! Instead of out of town fly by night roofers, EHS Services is a brick and mortar, insured roofing company here locally. I trust this company! © 2018 EHS Exteriors. All Rights Reserved.